Abraham Felix truly has the right to be called a professional. Despite going to a college without a film major, Felix spent the next several years after graduation doing the work and grinding it out. The extended apprenticeships (in the form of jobs at video production companies and creative agencies) built him up until he was ready to spread his wings and fly away; now he calls the shots. 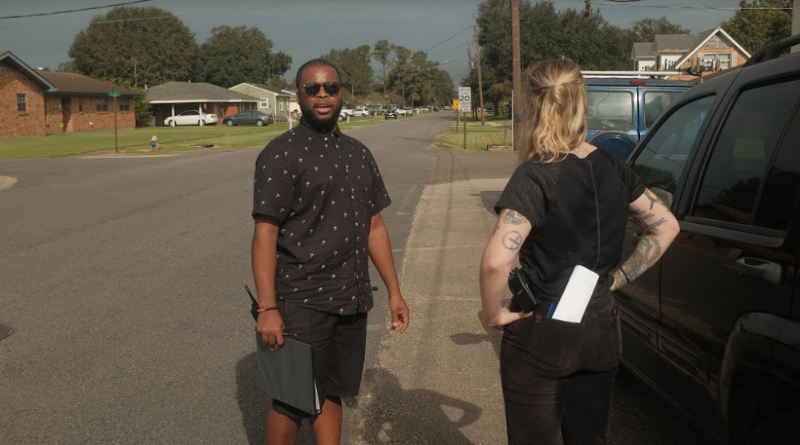 As a commercial and music video freelance director, Felix knows how to lead a team of technicians while honing his creative voice. But nothing has arguably been as personal and cinematic as his short film debut, Jane. Abraham talks with Miniflix about the experience of making Jane (both the good and the difficult), how he keeps even his most commercial assignments personal to him and the miracle moment that created the ending of his first film. Miniflix: What was your training background like? Did you go to film school? …so I was able to take a couple of screenwriting courses. That’s when I watched Lawrence of Arabia and No Country For Old Men. We were dissecting these movies and writing screenplays while being inspired by those films. So I started to look at the craft of it… From there, I graduated with a degree in Broadcast Journalism and got some job offers…and turned them all down. I got a degree in it, but I knew I didn’t want a job in it. It’s a very rigid way of telling a story. But once I turned down those gigs, I started working for a wedding video company. Did that for 2.5 years. While I was there, I started working as an editor, just working from the ground up. What I learned there was how to craft a story…because they weren’t making cookie-cutter wedding videos. They were trying to tell stories about what was happening on the day of. It was like a short film every week. So I was editing those non-stop for two years until I started pushing to be on these shoots and they let me shoot. So by two and a half years after college, I’d learned the skills to do editing….and cinematography. From there, a local agency noticed my work and hired me as a cinematographer. I learned a lot about lighting from a great guy there by the name of Eric Hutchison. We had a lot more time to play around with things and experiment with looks. Every now and then we’d go out and shoot a music video or side project — get those reps. So I did that for three years. In total, that was a 6-year period that was like my film school, where I gained a lot of the contacts that you would otherwise get in film school, and had a lot of the experience you’d otherwise get in film school. Miniflix: Overall, do you feel your directing style changes at all between commercials/music videos and short narrative projects? Do you feel yourself approaching these differently on set? Abraham: I think that for what brands want, it engages a different side of the creative process. It’s problem solving. What I’m looking for in a narrative project is usually to express something. So I think that those are at two different ends of the spectrum of each other….but story is still the vehicle by which I like to either have something connect emotionally to someone or solve the problem. Sometimes, they look the same — or pretty similar. Because [for a brand] sometimes having a project connect with audiences emotionally is the thing that ultimately solves the problem. Or sometimes they just want something that looks flashy and cool…and that solves the problem. So it’s really just a matter of what people are looking for. Brands are always looking for something a little different. Granted, that’s even evolved over time, with different media and the way the landscape has changed…so it’s about keeping up with where things are going. But it’s ultimately about telling stories. I like telling human stories. Things that affect me. I guess I’m just lucky if they ever affect anybody else. M: I was seeing some prominent stylistic through-lines in your commercials and music videos. Specifically the preference for long-takes (or at least the perception of long takes). You like having the camera follow characters through rooms. Is this fascination with going through someone’s individual process a conscious decision you make on these projects? Do you prefer working in these kind of intimate, tightly focused projects? A: Honestly, I guess whatever you just described is whatever they mean when they say aesthetic or style, because I don’t think for me that’s a conscious choice. What I try to do is just do what connects with me. It’s like the difference between digital and analog for me. Or it’s the difference between a tactile book and reading a Kindle…. A lot of how I was shaped growing up was believing in the value of taking the time to sit in a place and just observe a thing. To just let your understanding of it evolve over time. I like that style of storytelling way more than the flash that gets people’s attention. It’s not inherently commercial, but I can never seem to bring myself to make those things. I really try not to put things out there that don’t connect with me. I’m my own filter. If it authentically connects with me, I’m in. M: What do the pre-production stages of a commercial typically look like? What are the discussions like between you and the company you’re working with? Is the story (narrative) and the conception of the project usually coming from you? A: What that looks like from the beginning of the process is having frank, open, honest discussion with people. I want to know what it is they’re trying to accomplish with the piece that they’re hiring me to create. I ultimately want to know why. I want to know what ideas they’ve got formulating, so that gives me something to latch onto and build from. And a lot of times my idea will be completely left field, and that gives clients the chance to think differently about their idea. And sometimes they see the vision and say “That’s too far in this direction. You gotta bring it back and make it safer,” because ultimately a lot of the time, the agencies you’re collaborating with are not the people who get the final say. So their job is on the line when they’re pitching [my idea] to their boss. Sometimes we have to make it as safe as possible to appeal to the broadest audience base possible. And sometimes you get a dream scenario where they want to push and they give you all the latitude in the world to create. It varies project to project. M: What’s the story behind Jane? A: This whole journey started for me in 2016. This was the year I’d quit my job. I was trying to be an independent director, as well as taking other jobs to survive. The biggest part of quitting my job was so that I could try and make a movie. There was no way I would be able to dedicate as much time, energy and resources necessary to making a short film as I could while I still had that full-time job. In the Fall of 2016, when things were stabilizing and starting to slow down, as the year always does, I had the time to start writing. 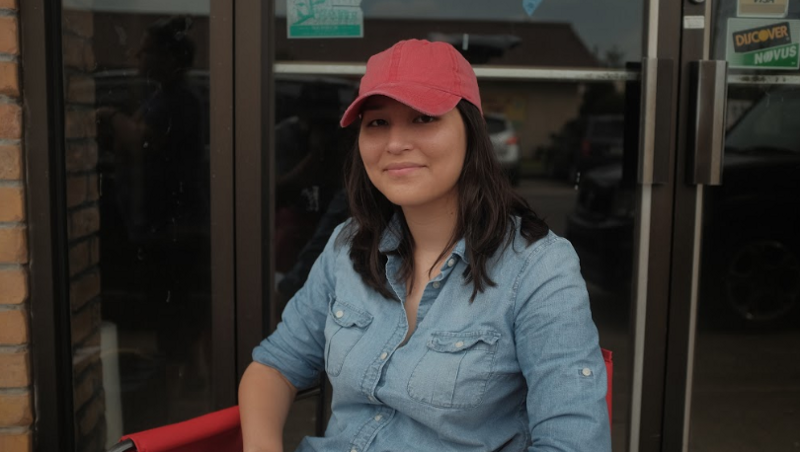 Catherine [Miguez], my co-worker at the agency, she started talking to me about the things that mixed-race people deal with. For me, some of the stuff she was detailing was just heartbreaking…and she was telling me parts of her story and what she was dealing with and it was all new to me. In my research, hearing from other mixed-race people was equally heartbreaking. And admittedly, I was so focused on what black and white ends of the spectrum, I’d never the folks in the literal middle of that dynamic. Plus, Catherine had been telling me for the longest time that she’d wanted to act. So I started thinking: I have a story, I have an actor, and if I involve someone else in the writing process that’ll help me turn off that critical side… It took us forever to write it for how simple it ultimately ended up becoming. But that’s because we were bouncing our very critical selves off of each other. I wrote from September 2016 to April or May of 2017. We wrote and start sending it out and getting feedback from people. But by the time it got to June or July, we’d determined that we were going to shoot it. Then it was really a matter of figuring out what dates we were going to put on the calendar and how we were going to fund it. So we crowdfunded it. After doing a ton of research on how to not fail a crowdfunding campaign. M: Yes, crowdfunding seems so easy to start but really difficult to finish. A: Yeah, from the month of September through October I was just sitting in a chair, sitting at my house just typing emails and checking social media….for a month straight. It was miserable at times…but it was necessary. Especially to gain an audience upfront by just talking about the issue and talking about the “why” behind the project. If we look at the way the world is around us right now, it’s hard for me to put something out that doesn’t say anything important or necessary. As something that can lead to some sort of progress, or for people to go through some level of introspection. The films that’ve really inspired me are the films that feel like a mirror. That lead me to look at myself in a different way. What I want to do with my filmmaking is give that gift back to the people. I want to put mirrors up to people, so that they can see themselves in a different way. That really was the impetus for how, and why, Jane took shape. M: The thing that struck me first is what was left out of the film. Did earlier versions of the script ever take place at her house first, or in New Orleans once she finally arrives? A: I almost completely rewrote the script one week before production because of the amount of money that we raised, which then limited the number of production hours that we were going to try and do. And also, the difficulty of finding a 60-year-old Vietnamese actress — I mean, we were going to have to get someone in from Los Angeles. And there’s a whole cost associated with that. There was no way, with this being my first film, and the money we had, to pull that off. So we chopped off the first scene of the film, which was actually her having a conversation with her parents as she was getting ready to leave. Visually, she was seeing the difference between the mom and dad, and then herself, being trapped between those two different worlds. Fortunately, we were able to come up with a clever way to work around that, with the voiceover. And in the end, we were supposed to see her land in New Orleans and have this very 90s moment where she lands and there’s music playing and she walks into a crowd of people. And that was a whole deal with permitting. If we’d made Jane with twice the money or better connections five years from now, maybe we could have done some of that stuff on the same budget. But for where we were, from what we were trying to accomplish with the story, the crux of the story was really this one moment in her life, what she’s living through and the decisions she makes. So we decided to center on the emotional heart of it. M: How many days did you shoot this? What camera? Since so much of this is in the car, what sort of camera crew did you have in place? A: We wanted to shoot for two days, but the budget dictated that we could only shoot for one day. It was a six page script, thoroughly feasible, and the weather came in and torpedoed the shoot towards the end. So it ended up being a day and a half of production. We had about 15 crew members at the most. The thing is, we had some night shooting that we attempted to pull off…but weather torpedoed that. So we weren’t even able to film that stuff. 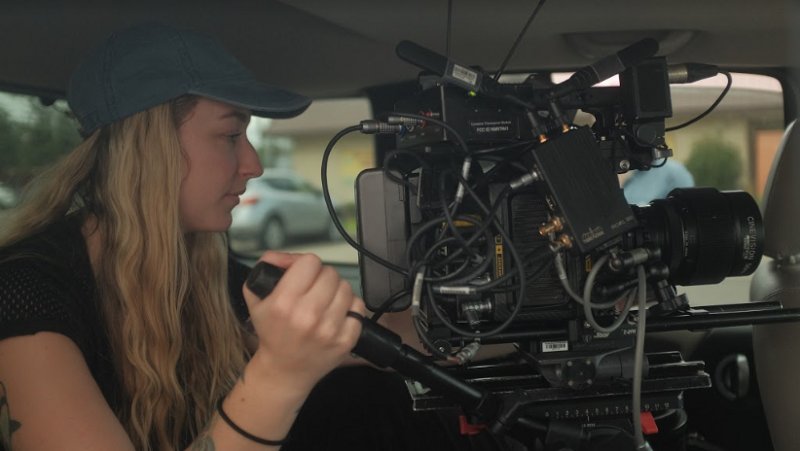 It was just a matter of being nimble with the camera crew, because we were cramming Catherine into the driver’s seat, myself, the DP [Shannon Palmer] and 1st AC [Tyler Laperouse] in the back of an SUV. Then the sound guy’s got to be at least 20 meters away in the follow-car so he’s getting a signal. We shot on the Alexa Mini. We knew we wanted to shoot on the best camera possible to do the story justice. And we knew we were going to have a lot of highlights and low tones to play around with and capture. We obviously didn’t want to lose the detail from either end of the spectrum…so it came down to the aesthetics and look of the film. And that was all lensing. That’s where most of our decision making was with lensing. We wanted to show off this land that was beautiful. What anamorphic lenses allow you to do, especially in a lot of the older, vintage stuff, is give it that character and texture that’s sort of distorted. So we shot with Cineovision anamorphic primes that came from D.C. They really have this sort of mysterious quality — it does these crazy things in the bokeh and the edges of the frame. Kind of what it looks like in Moonlight. We knew that shooting against the cane, we wanted it to have a certain distorted feeling. So lenses were really where we did the most testing. Shannon also thought it was really important to shoot anamorphic to isolate Jane within the frame, which most of the time meant being surrounded by negative space. Jane is such an isolated character, so Shannon was completely right. M: That other version obviously could have worked too. But I think there’s something beautiful about the economy of vision in Jane. You got some very beautiful exteriors of Louisiana open country in this film. Was most of this stuff in-camera, or was there an extensive post color grading process to bring out more of the contrasts? A: It was mostly in camera. There were inconsistencies that I ironed out in color grading. One of the interesting things with that set of lenses, is the way they handle flare. It’s something we couldn’t really test for beforehand, just because the lenses came in like a day before. We didn’t have a lot of time. There were a lot of inconsistencies with the way that the sky would look sometimes, just with the way the sun would hit the lens. It would sometimes wash the sky out in a way that really didn’t look that way in real life, but then would look completely different when the dark clouds would roll over. So we were constantly fighting that. M: How much of the film did you leave open to anything happening? I think specifically of the lingering shot on the cane harvesters towards the end. You certainly couldn’t have planned that..I think. A: The shot of the harvesters was on the second day of filming. This was after our night shooting had failed, with no money to get reshoots later on. We were up against the gun to figure out a new way to pack the emotional weight of the film: to get an ending. When we went to bed at 1:30 in the morning, I didn’t have an ending to the film. So I’m lying awake, trying to figure out how we are going to land this plane. On that second day of shooting, literally right next to us, they were harvesting the sugar cane, which, at that point in the film, the sugar cane is a very powerful visual motif and metaphor. The sugar cane was metaphorically representative of all the problems that she’d was dealing with and surrounded by, along with tying her to the Louisiana environment in a pretty way. So the whole time we’re filming the crux of the emotional scene, at some point I figured out “wait, it’s happening right there”. The harvesting was literally right next to us…. …So once I realized that was the ending of the movie, that if we get a shot of this cane being harvested — just cutting down all her problems — it’ll match what she’s giving us internally… Shannon hustled, she got the camera up and she got it in one take. And it went fine. But, you know, that was the shot. That’s the whole movie for us. And that was a complete blessing. M: This is really a one-woman show. There are some long, quite uncomfortable scenes where Catherine just has to be in that exact right place emotionally. What did you do (if anything) as a director to help her, especially during the scenes when she is listening to the audio? A: The beauty of co-writing with the actress was that she understood what she needed to do and where she needed to go emotionally from the beginning. And I’m very thankful she’s as talented as she is because there were so many things going on production-wise that I couldn’t be as connected to her as I would have liked to be. She really took a lot off my plate, but I tried to balance handling logistics and being present for her. Catherine was emotionally and mentally prepared for whatever we threw her way. We had a conversation in the beginning where I just told her to protect her mental headspace — the emotional state of where she had to be in. A: I’ll say what’s capturing my attention right now. It’s Thunder Road, the short film by Jim Cummings, who has now made the feature. It’s a oner. I love oners. There’s such power in not cutting and not telling the audience what to feel. There’s so much more power and authenticity in letting them be in the moment in real time and feeling what they’re going to feel for themselves so that everyone has a different reaction, and can talk about it after the movie ends. I find a lot of inspiration from that one because you see this entire emotional arc. There’s a great performance. And the camera is also moving in a very intentional way that always inspires me to make sure that the character is dictating where the camera goes, how the camera moves in relation to the character. You can reveal so much through thoughtful camera movement. I want to respect that and not just put the camera in a bunch of interesting places. It reminds me that I never want to put out something that doesn’t resonate with me first.